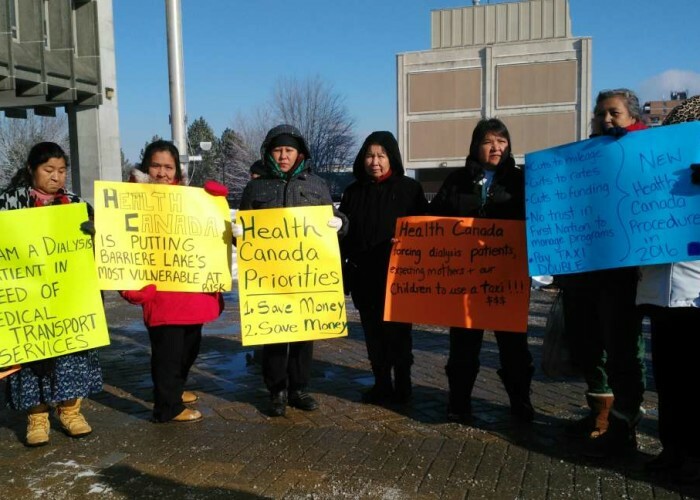 (Rapid Lake/Ottawa) The Algoqnuins of Barriere Lake are deeply disappointed with Health Canada’s response to a recent protest against the department’s medical transportation procedures that put community members’ health at risk (see last Thursday press release here). Barriere Lake is an Algonquin Anishnaabe community located in western Quebec, 3 ½ hours north of Ottawa. Health Canada acted unilaterally once again imposing discriminatory rules that make it difficult for community members on the reserve to follow up their regular medical appointments, which could result in serious consequences for the vulnerable including children. Since December, the imposed rules by Health Canada have resulted in community members missing over 20 medical appointments. Currently, Health Canada gives their nurses working in the community the liberty of calling taxis for emergencies and dialysis patients. As for other community members to access transportation services to meet their medical needs there is still a 48-hour pre-authorization required by the regional Health Canada bureaucrats. Continuing with the use of taxis for medical transportation would cost Health Canada approximately $15,000-$20,000 for a two-week period whereas, community drivers would receive a fraction of that amount for the month to provide essential services to eligible beneficiaries under the funding agreement signed between Third Party Managers (TPM) and Health Canada. “Health Canada makes up rules as they go which clearly confirms that both TPM and the regional office have not implemented the national medical transportation framework policy since 2006. We have not heard from other First Nations complaining about medical transportation services. Why is our community being treated this way as we are the most vulnerable from all other nine Algonquin First Nation communities? The nearest health facilities are located 160km north, in Val-D'or, or 150km south, in Mont Laurier and Maniwaki.” stated Jessica Thusky, Health Coordinator at Barriere Lake. Given violence against Native women in the region, women in the community are uneasy taking a taxi a long distance on a fairly isolated highway with a stranger. The community-contracted drivers ensure those traveling to appointments feel comfortable as the drivers are known, speak Algonquin and are respectful of their passengers’ needs. By exclusively relying on taxis from neighbouring towns rather than drivers from the community, Health Canada’s imposition is contrary to the goal of the Liberal government for a new relationship with First Nations particularly through reconciliation and the national inquiry on the missing and murdered Indigenous women. Barriere Lake demands that authorization for all medical transportation be returned to the community and that the services from the community-contracted drivers is immediately restored. For background on the Algonquins of Barriere Lake: www.barrierelakesolidartiy.org.